I have heard nothing but praise for the brand Alpha-H, so when I had the chance to try the brand for myself I couldn't wait. I've been putting the 4-Piece Radiance Skin Essentials* to the test and I've noticed such a difference in my skin already. 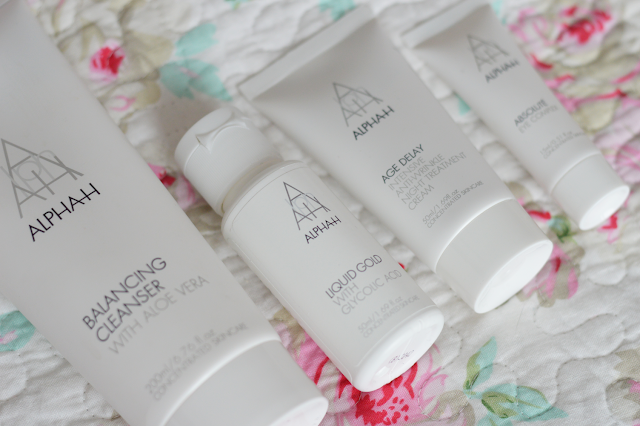 I have had to be strict with my skincare routine and make sure I stick to it. That's because of the AHAs, I'm sure you've all heard of AHAs before but in case you haven't I shall fill you in. Glyloic Acid- an alpha hydroxy acid (AHA) mixed with a blend of botanical ingredients, work together to even, brighten, smooth and firm skin. I love trying new skincare products and seeing the benefits, I'm so glad I've been able try their best-selling Liquid Gold lotion. This is the first product which jumps in my head when I hear Alpha-H mentioned. I noticed a difference the first time I tried Liquid Gold, my skin looked clearer, smooth and even. Think 'overnight facial in a bottle' and you'll soon get it. For best results it's recommended you apply Liquid Gold with a cotton pad all over the face as you would a toner and then leave it overnight. Don't apply any moisturisers or other treatments. I use this 2-3 times a week, as suggested by Alpha-H. It's also very important you remember to apply a sunscreen when you're using any products which contain AHAs in your skincare routine. This is because you're skin is more sensitive to the sun and can easily be damaged. Luckily a lot of moisturisers/BB Creams/foundation contain sunscreens. So just check you're using a sunscreen, I would recommend a SPF15 and over. For cleansing I've been trailing the Balancing Cleanser with Aloe Vera, I use this morning and evening. You can use this to remove stubborn waterproof mascara but I've not tried it yet on the eyes. I like to use a Micellar water to remove my eye makeup. My skin feels clean, fresh and not at all tight. On days when I'm using the Liquid Gold I will follow with that and end my routine with the Absolute Eye Complex. The days when I'm not using the Liquid Gold I use my toner and then follow with the Age Delay Intensive Night Treatment. I can't believe the difference I've seen in such a short space of time. The mix combination of products all work unison making them the perfect additions to any ones routine. My skin feels plump, hydrated and looks so much more clearer. I'm putting that down to the Liquid Gold. The Absolute Eye Complex is a gel formulation, great for soothing tired eyes. It can be used all over the lid as a primer and is great for applying over makeup during the day to give you a wake up call! 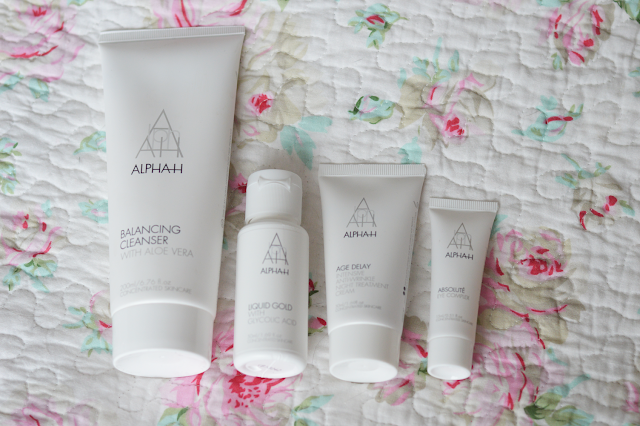 You can purchase the Alpha-H 4 Piece Radiance Skin Essentials set online from QVC Beauty. This set is a great way of trying the brand. Love the look of this, I'm a big fan of Liquid Gold so may have to check this out! The other products in the Alpha-H range have all been winners! I love the balancing cleanser! Yeah there's some products/brands my skin doesn't agree with. Have you tried it often?